One of the buildings that may be torn down at the former Northridge Mall. Chuck Quirmbach reports on the potential removal of most of the former Northridge Mall buildings. 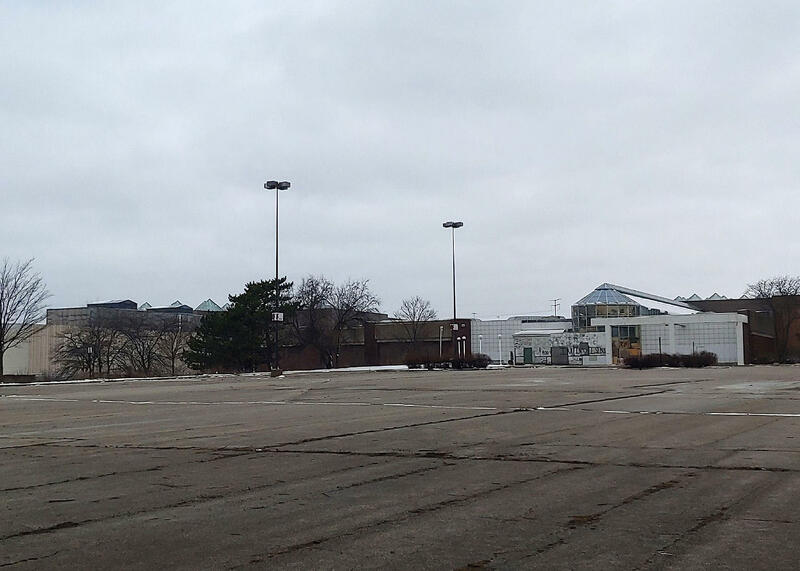 Northridge Mall — on Milwaukee's far northwest side — closed 16 years ago. Part of the site has been redeveloped. But most of the buildings remain vacant. Almost all are owned by a Chinese firm, U.S. Black Spruce Enterprise Group. City of Milwaukee officials have been urging Black Spruce to develop the property, but say the company has refused to move forward. Meanwhile, Northridge-area Alderperson Chantia Lewis says vandalism has increased. 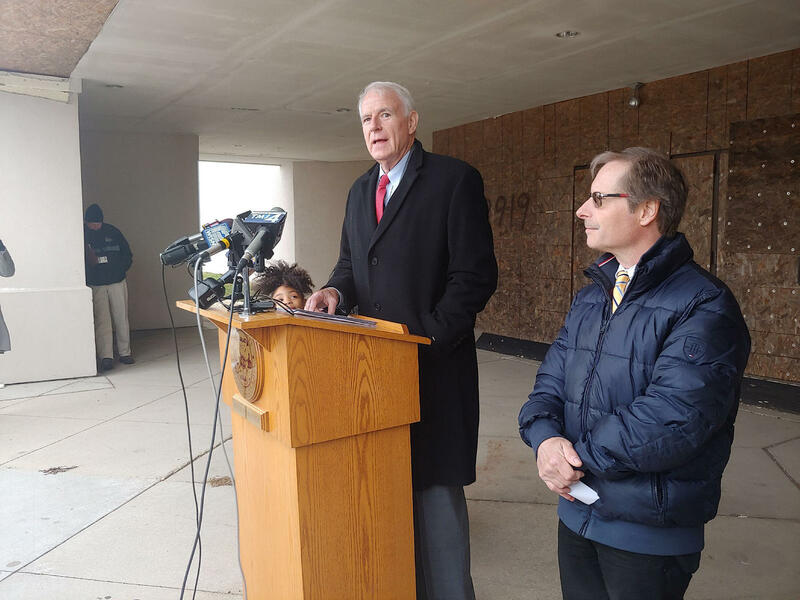 Mayor Tom Barrett speaks at a Thursday news conference outside the former Northridge Mall, as Tom Mishefske, of the Department of Neighborhood Services, listens. Tom Mishefske, of the Milwaukee Department of Neighborhood Services, adds that the former mall now needs an estimated $6 million in repairs to restore it to useful condition. "There's significant damage to the mechanical systems. The exterior is showing signs of distress. The freeze-thaw cycle has compromised the roof to a point where it really would require the entire roof to be replaced," Mishefske says. But he says the three parcels of property — about 900,000 square feet — of most concern to the city, have an assessed value of a little more than $80, 000. Under a state law that calculates the cost of repairs and property values, the city says it has the authority to take the step it announced at a Thursday news conference: issue three orders to raze and remove the buildings. Barrett says he's also concerned about future liability costs. "The real issue that put this over the top was the concern about the health and safety of individuals who are coming in here illegally, and what would happen if something horrible would happen to someone who came in here illegally. Who's going to be responsible for that, and what are the damages going to be?" Barrett says. Another view of the outside of the former mall. He says Black Spruce Enterprise Group has 20 days to respond to the raze orders. The mayor says it would cost a lot of money to tear down the buildings and clear the land. He says if Black Spruce refuses to pay, the city would go ahead, and then put the cost on the company's property tax bill. Barrett and Lewis say it's too early to say what might go into the former Northridge property. But, they say the vacant buildings have impeded redevelopment. The farmers whose cows supply much of the milk consumed in Wisconsin, or used in products like cheese and yogurt, are having a tough time. Eight percent, or nearly 700, of the state's dairy farmers left the business last year for economic reasons. A few thousand more farmers got out over the previous five years. Those still at it say being creative is one of the things they have to do to keep going. The state of Wisconsin is famous for a number of things — beer, cheese, the Green Bay Packers and, if you're into this sort of thing, mail order catalogs.